Md. Abdul Quddus, J: Accused appellant Mokbul Hossain and non-appealing convict accused Md. Isahak Sarder were placed on trial before the Special Tribunal Naogaon for offence under Section 25A(b) of the Special Powers Act. 1974 in Special Tribunal Case No. 117 of 1993 arising out of Naogaon PS Case no. 11 dated 15.10.92 GR No. 155 of 1992. Upon evidence during trial both Mokbul Hossaina and Isahak Sarder were convicted and sentenced to rigorous imprisonment for 5 (five) years each with fine of Tk. 5000/- in default to suffer rigorous imprisonment for further 1 (one) year by judgement dated 2.11.97. 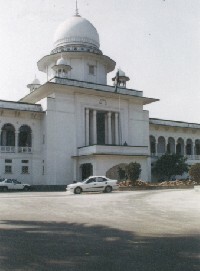 Prosecution case in brief, was that convict appellant Mokbul Hossain a peon of Zilla Parishad Naogaon used to live in an area wherein one parvin mother of Truck Dirver Latif used to live as Bharatha. Said Pervin Begum gave one fresh 500/- currency note for change to Mokbul Hossain who in good faith went on 15.10.92 to Sonali bank Branch Naogaon for that purpose. Bank Staff suspected the said 500/- taka currency note to be counterfeit and detained Mokbul Hossain with the said currency note. Police subsequently came to the bank, arrested Mokbul Hossain, seized the 500/- currency note numbering Kha, Ka, 663323 by seizure list prepared in presence of witnesses at 11.15 hours on 15.10.92. SI Sekendar Ali who seized the said currency note as above lodged an FIR at 14.30 hours on 15.10.92 in Naogaon PIS wherein duty officer on receipt of the written FIR started PS Case No. 11 dated 15.10.92 investigation commenced. Seized 500/- taka currency note was sent to Bangladesh Bank Dhaka for technical test and report as to whether it was counterfeit or not. During investigation one Pervin Begum 60 years old mother of truck driver Latif was arrested and produced before Magistrate. PW 6 AT Kholilur Rahman recorded her statement under section 164 of the Code of Criminal Procedure on 19.12.92. During investigation police examined witnesses, prepared map and index of the PO received report from Bangladesh Bank as to the genuineness of the said 500/- taka currency note and after conclusion of investigation charge sheet was submitted under section 489 ga of Penal Code read with section 25A of the Special Powers Act 1974 against Isahak Sarder and submitted final report with regard to Md. Mokbul Hossaina and Pervin Begum. Case record was sent to Special Tribunal Naogaon wherein cognisance was taken under Section 25A (b) of the Special Powers Act, 1974 against Ishaque sarder vide order dated 23.6.93. Afterwards vide order dated 28.10.93 further investigation was directed with regard to Mokbul. Once again final report was submitted with regard to Mokbul Hossain by CID Police. Special Tribunal took cognisance against Ishaq Sarder and Mokbul Hossain under Section 25A(b) of the Special Powers Act 1974 under order dated 23.5.96. Upon consideration of the evidence on record the learned Special Tribunal found both accused Ishaque Sarder and Md. Mokbul Hossain guilty under section 25A(b) of the Special Powers Act, 1974 and convicted and sentenced each of them to suffer rigorous imprisonment for 5 (five) years and to pay fine of Tk. 5000/- in default to suffer rigorous imprisonment for 1 (one) year more in a judgement dated 2.11.97. Currency note of 500/= was directed to be sent to Bangladesh Bank to be forfeited as per rule. Being aggrieved convict accused appellant Mokbul Hossain preferred this appeal convict accused Ishaaque Sarder did not prefer any appeal. The learned Advocate for the appellant Mokbul Hossain takes a legal objection as to taking of cognisance by the Special Tribunal under section 25A(b) of the Special Powers Act, 1974 against the appellant Mokbul Hossain. He submits that the Special Tribunal cannot take cognisance under Special Powers Act against any one without police report by any officer not below of sub inspector. According to him final report cannot be police report as contemplated under section 27(1) of the Special Powers Act, In this connection he refers to decision in the case of Dust Mohammad and others Vs State reported in 29 DLR Page 122. The next submits that in order to find any one liable for offence under Section 25A(b) of the Special Powers Act 1974 it must be established on evidence that the accused has used as genuine any counterfeit knowing or having reason to believe the same to be counterfeit. He refers to statement under section 164 of the Code of Criminal Procedure of one Pervin mother of one Latif Truck Driver. She used to reside as Bharatia tenant in a house of accused Ishaque in the same area wherein convict appellant Mokbul Hossain used to live. The statement under section 164 of said Pervin Ext. 6 shows that she paid a fresh currency note of Tk. 500/- to accused Ishaque as owner of the house but Ishaque returned after 3 months an old currency note of Tk. 500/- to said Pervin who gave the same note to Mokbul Hossain for change from the Bank. In good faith Mukbul complied the request of said Pervin and went with the said old currency note of Tk. 500/= for change in Sonali Bank branch Naogaon. He never knew the same to be counterfeit. Bank staff then suspected the currency note to be counterfeit and detained Mokbul with the note and subsequently he was handed over to the police who seized the note and arrested him and lodged FIR in the Thana. Learned Advocate shows from the record that PW 2 and 3 Bank staffs Bebhuti Saha and Anwar Hossain suspected the seized currency note of Tk. 500/- from accused Appellant Mokbul to be counterfeit but did not testify anything to this effect that accused Mokbul came to bank in order to use the same as genuine knowing the same to be counterfeit. He refers to evidence of PW 7 Raihan Ali Assistant Manager Bangladesh Bank Bogra branch who issued certificate Ext. 8 to the effect that seized currency note of Tk. 500/- was counterfeit and refers to Ext. 9 issued by currency officer Bangladesh Bank Dhaka to the effect that said seized currency note of Tk. 500/= was counterfeit. Learned Advocate argues that he does not dispute Ext. 8 and 9 as to the seized note to be counterfeit but he argues earnestly that nothing came in evidence that Mokbul used the said note as genuine knowing the same to be counterfeit. He accordingly submits that there being no legal evidence against accused appellant Mokbul impugned order of conviction and sentence against him cannot be sustainable. According to him the appeal must succeed. (1) Notwithstanding anything contained in the Code or any other law for the time being in force a Special tribunal may take cognisance of an offence under this Act without the accused being committed to it for trial. But shall not take cognisance of any such offence except on report in writing made by a police officer not below the rank of sub inspector. From the provisions of section 27(1) as above, it appears that Special Tribunal cannot take cognisance of any offence against any accused except on a report in writing by a police officer not below the rank of sub-inspector. It appears that cited decision on behalf of appellant in the case of Dustu Mohammad and others Vs. State reported at page 122 can have no bearing and application in the present case in as much as in the said case Magistrate observed that the case should be triable by Special Tribunal. And accordingly case record was sent to Special Tribunal which took cognisance erroneously against the accused without any police report under Section 27(1) of the Special Powers Act. Said order of cognisance by tribunal was challenged and it was held that there is no corresponding provision in Special Powers Act for taking cognisance upon information received from any person other than police or upon his own knowledge or suspicion that such offence has been committed like provisions of 190(1) (C) of the Code of Criminal Procedure. Therefore, it was held that taking of cognisance by Special Tribunal under Section 190(1)(C) of the Criminal Procedure Code without any police report as required under Section 27(1) of the Special Powers Act 1974 the proceeding itself was liable to be void. Cited decision as above has no manner of application in the case before us. It appears from scrutiny that police submitted charge sheet against accused Ishaque and submitted final report about Mokbul and Pervin under Section 173 of the Code of Criminal Procedure. Since the offence alleged was a scheduled offence the case record was sent to Special Tribunal which issued summon against Mokbul and also directed further investigation with regard to Mokbul but once again CID police submitted final report about Mokbul Hossain. Special Tribunal then vide order 23.5.96 took cognisance under section 25A (b) of the Special Powers Act against Ishaque Sarder and Mokbul Hossain ignoring the final report of the Police. A question has been raised without final report submitted by police about any person will be a police report as contemplated under Section 27 (l) of the Special Powers Act. Answer is available from the decision in the case of A. Hoque Vs. State reported in 29 DLR pag 428 where in it was held that police report under section 27 (l) includes also final report. Similar view was taken in the decision of the case of Nuru Bepari Vs. State reported in 31 DLR page 241 where in it was held that police report under section 27 (l) of the Special Powers Act is not binding on Special Tribunal which can disregard the same and take cognisance against the accused. In above contest Special Tribunal committed no illegality in taking cognisance under section 25A(b) of the Special Powers Act against Mokbul Hossain disregarding the final report of the police submitted under Section 27 (l) of the Special Powers Act, 1974. Next point as agitated on behalf of appellant is that accused appellant Mokbul did not use as genuine seized currency note of Tk. 500/- knowing or having reason to believe that said currency note was counterfeit in order to be liable under section 25A(b) of the Special Powers Act. On perusal of the evidence adduced at the trial it appears that 9 P.Ws. were examined at the trial P.W. I was informant S.I. Sekander Ali who seized currency note of Tk. 500/- by seizure list Ext. 2, arrested accused Mokbul and lodged FIR Ext. 1. P.W. 5 S.I. Alamgir who as 1/0 Prepared Map with Index of the P.W. Ext. 4. P.W. 4 S.I. Abu Dakar who submitted charge sheet against accused Ishaque only. From evidence of P.W. 1,4 and 5 as above nothing came forth to show that accused appellant used as genuine the seized currency note of Tk. 500/-knowing the same to be counterfeit. Rather P.W. 4 submitted final report about Mokbul. P.W. 2 and 3 wee Bank staffs of Sonali Bank branch Naogaon. They suspected the currency note of Tk. 500 as produced by Mokbul to be counterfeit and detained Mokbul with the note. P.W 2 and 9 were seizure witnesses in Ext. 2. P.W 2, 3 and 9 did not specifically prove that Mokbul used the seized currency note of Tk. 500/= knowing the same to be counterfeit. P.W. 6 was Khalilur Rahman Magistrate, 1 Class, Naogaon who recorded statement under section 164 of the Code of Criminal Procedure of one old women namely Pervin. He proved the statement marked Ext. 6 from which it appears that said Pervin paid fresh currency note of Tk. 500/- as rent of the house of the owner accused Ishaque who after 3 months returned to her on one old currency note of Tk. 500/- Pervin gave said note to Mokbul for change from Bank. Nothing was disclosed in Ext. 6 that Pervin stated to Mokbul about the note to be counterfeit. Therefore nothing came forth that Mokbul was aware that note was counterfeit. P.W. 6 Assistant Manager Bangladesh Bank Bogra branch proved Ext. 8 and 9 that on test seized currency note of Tk. 500/- was found to be counterfeit. Evidence of P.W. 6 and Ext. B and 9 cannot be used against accused Mokbul to make him liable under Section 25 A (b) of the Special Powers Act 1974 in as much as appellant did not challenge seized note to be counterfeit but his plea was that he did not used as genuine said note knowing the same to be counterfeit. On perusal of Exhibits and evidence of P.W. 1-9 we find no evidence against Mokbul to make him liable under Section 25A (b) of the Special Powers Act. 1974. We noticed earlier that learned Assistant Attorney General frankly admits that above position as evidence from the record that no evidence came forth at the trial to show and prove that Mokbul Hossain used genuine the seized currency notes of Tk. 500/= knowing the same to be counterfeit. In above contest we find no legal evidence to make accused appellant Mokbul Hossain liable for offence under section 25A(b) of the Special Powers Act, 1974. Impugned judgement and order conviction and sentence by Court below can not be sustainable. Appeal must succeed. In the result Criminal Appeal No. 2226 of 1997 is allowed. Impugned judgement order of conviction and sentence dated 2.11.97 by Court below against accused appellant Mokbul Hossain are set aside. Accused Appellant Mokbul Hossain is found not guilty under section 25A(b) of the Special Powers Act, 1974 and he is accordingly acquitted of the charge thereunder. Mr. Shareef ahmed, for the petitioner and Ms. Shamima Ara Dora, AAG. for respondent.